This artist's impression of a future aerobot in the Venus atmosphere was taken from a presentation at the 2010 European Planetary Science Congress meeting in Rome. Lightning onVenus and Earth may spark in much the same way despite vast differences in theatmospheres of the two planets, scientists say. "Venus and Earth are often called twin planetsbecause of their similar size, mass and interior structure," said ChristopherRussell, lead author of the new lightning study and a professor at theUniversity of California, Los Angeles." The generation of lightning is onemore way in which Venus and Earth are fraternal twins." Russell andhis colleagues used new data from Venus Express to show that lightning issimilar in strength on Earth and Venus at the same altitudes on both worlds. "Wehave analyzed 3.5 Earth-years of Venus lightning data using the low-altitudeVenus Express data (10 minutes per day)," Russell said. "By comparingthe electromagnetic waves produced at the two planets, we found strongermagnetic signals on Venus, but when converted to energy flux we found verysimilar lightning strength." The dataalso show that lightning is more prevalent on the planet's dayside than atnight, and occurs more often at low latitudes, where the solar input to theatmosphere is strongest. Theseresults will help scientists better understand the chemistry, dynamics andevolution of the atmospheres of the two neighboring planets. Russell will present the findings tomorrow (Sept. 23) at the European Planetary ScienceCongress in Rome. Ground-basedtelescopes have also captured evidence of lightning flashes on Venus, but from a theoretical standpoint,the topic has been controversial. 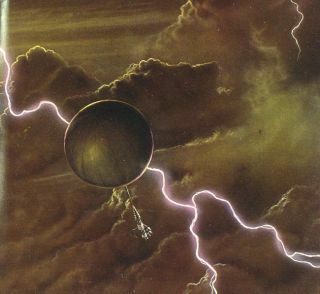 Since theatmospheres of Venus and Earth are so different, some scientists have claimedthat Venusian lightning is unlikely ? if it exists at all. The clouds of Venus are much like smog clouds on Earth, whichtypically do not generate lightning. The EuropeanSpace Agency's Venus Express probe currently orbiting the planet has since shedsome light on how the two worlds are, in fact, more similar than previouslythought. To trackVenusian lightning , the Venus Express probe is equipped with a magnetometer thatmonitors the planet's magnetic field at altitudes between 124-310 miles(200-500 kilometers). Theinstrument has picked up low-frequency radio waves that last for a split secondand are thought to come from electrical discharges. "Short,strong pulses of the signals expected to be produced by lightning were seenalmost immediately upon arrival at Venus, despite the generally unfavorablemagnetic-field orientation for entry of the signals into the Venus ionosphereat the altitude of the Venus Express measurements," Russell explained. When cloudsform, on Earth or Venus, the energy that the sun has deposited into the air canbe released in the form of a very powerful electrical discharge. As cloudparticles collide in the atmosphere, electrical charges are transferred fromthe larger ones to the small. The large particles fall, while the smallparticles are carried upward. This separation of charges leads to lightning strikes. Studying howlightning is generated in a planet's atmosphere is important because the phenomenoncan raise the temperature and pressure of a small portion of a world's overallatmosphere to a very high degree, enabling molecules to form. This wouldotherwise not occur at standard atmospheric temperatures and pressures. The processhas led some scientists to speculate that lightning may have helped life ariseon Earth.? On Earth,approximately 100 discharges of lightning occur every second, but the number offlashes at any single location is much lower. Similarly,on Venus scientists are not able to see the entire planet, so they mustestimate the total occurrence rate with some assumptions about how far VenusExpress's instruments can see.